Mar 19 1863. I received the following report from Gen. Prentiss, informing me that operations through the Yazoo Pass against Fort Pemberton are going poorly. Helena, Ark., March 19, 1863. GENERAL: I have the honor to report that my latest advices from General Ross are of the date of the 15th instant, when he was still confronting the rebel fort, Greenwood. He was still at work cannonading the enemy, but had made little or no impression on them, although he had added an 8-inch howitzer to his land battery. General Ross reported the fort as being much stronger than was anticipated, and required more work for its reduction. We intended on Monday to resume firing, but could not sustain an action for over two hours, owing to scarcity of ammunition, for which he sent to me. Colonel Wilson also sent a requisition for four 8-inch siege howitzers and four 30-pounder Parrots. I to-day sent to General Ross a supply of ammunition, all I had here. Last night I dispatched a boat to Memphis to procure the guns called for, and ammunition for the same. I expect they will arrive to-night, so that they can be sent to General Ross to-morrow. I am sparing no pains to keep up communication with General Ross, keep him supplied with rations, &c., and do all in my power to help him till General Quinby assumes command of the expedition. I do not doubt my ability to keep up communications with both generals, but am sadly in want of transports at present. Fort Greenwood General Ross represents as inaccessible to infantry, so that he must depend upon artillery for its reduction. I look for further advices from there very soon. Was Grant’s time running out? Grant’s attempt to move troops through Steele’s Bayou to the Yazoo River was his fourth try to get behind Vicksburg and turn the Rebel flank. When (spoiler alert!) it failed, he had spent almost three months maneuvering around Vicksburg with nothing to show for it. The Union was fed up with military leaders such as McClellan who were perceived to dither rather than take the fight to the enemy. Grant found the goodwill built up by his victories at Forts Henry and Donelson quickly running out. There arose an intense pressure both from the general public and his own army to remove him. Mar 18 1863. I have passed by Milliken’s Bend, just up river from Vicksburg, and sent this letter to Gen. McClernand, whose Corps is encamped there. HEAD OF MILLIKEN’S BEND, La., March 18, 1863. It was my intention to have stopped at the Bend to-day to have explained fully to you the nature of the present movements. But being delayed so late, compels me to pass on to Young’s Point. I have had information, both from my own means of knowing and from Southern papers, that Ross has penetrated to Greenwood, on the Yazoo River; further, that the rebels have sent a number of steamers loaded with troops up to resist him. My efforts to get down steamers to carry troops to the support of Ross in time, have proven somewhat abortive. It is necessary, therefore, to give him aid from here. Admiral Porter, who was equally interested, and much more familiar with the country intervening between the Mississippi and the Yazoo, caused a partial exploration of the passes through by the way of Steele’s Bayou to Deer Creek, and thence to the Yazoo, for the purpose of getting in the rear of any force that may have been sent up. I went with the admiral on his SECOND excursion, and, so far as explored, know it to be perfectly practicable. I am, therefore, sending an infantry DIVISION to their support, at Admiral Porter’s request, and hope such favorable reports will be received as to justify me in sending all available forces through by that route. I would thus have all my forces concentrated at any given point, and save the necessity of dividing them, which I wish to avoid, if possible. I have countermanded the order for General McPherson to go through Yazoo Pass, on account of the difficulty of procuring the right kind of transportation, and because it is now too late, and will bring him with this end of the expedition. Two DIVISIONS, however, Generals J. E. Smith’s and Quinby’s, are going that route, and I hope Quinby is already with Ross. These are the facts which I wished to communicate principally, and to notify you that you should hold your corps in readiness to move when called upon. Mar 17 1863. I wrote Gen. Halleck informing him of the progress of the canal and our attempt to enter the Yazoo River by Steele’s Bayou. GENERAL: Since the giving way of the dam at the upper end of the canal, work with the dredges has progressed favorably, but all attempts to stop the rush of water into the canal have proved abortive. If required, however, the canal can be made to pass boats of ordinary size in a few days. The enemy were busily engaged firing from the opposite heights yesterday and last night at the dredge-boat nearest the lower end of the canal. Their shots did no damage, though many of the large ones reached half way across the point. Ordinary Ohio River boats can now pass from Lake Providence into Bayou Macon, and thence, by easy navigation, to the mouth of Red River. I make no calculations upon using this route for the present, but it may be turned to practical use after effecting present plans. The same may be said of the canal across the point. I learn from Jackson (Miss.) papers, of the 14th, that one of our gunboats had run down to Greenwood and exchanged a few shots with the fort at that point. Further information from the enemy shows that several thousand troops have gone from Vicksburg up the Yazoo River. Besides four gunboats (one of them iron-clad) I have a DIVISION of troops there now, and Quinby’s DIVISION in the pass on their way down. One DIVISION from Memphis should also be on their way down. The great difficulty of getting small-class steamers adapted to this service has retarded movements by the way of Yazoo Pass materially. To hem in the enemy on the Yazoo, Admiral Porter has gone into Deer Creek by the way of Steele’s Bayou and Little Black Bayou. From there he can get into the Yazoo either by running up Deer Creek to Rolling Fork, thence through the fork and down the Big Sunflower, all of which are navigable, or down Deer Creek to the Yazoo. Admiral Porter and myself went up Steele’s Bayou to Little Black Bayou on the 15th. With the exception of overhanging trees in some places, the navigation was good for the gunboat General Price. I am having those obstructions removed. We were preceded by four of the old iron-clads, that found no difficulty in the navigation. I returned in the evening for the purpose of hurrying up men and means for clearing the channel. I also sent Sherman to make a reconnaissance in company with the gunboats, with a view of effecting a landing with troops on high ground on the east bank of the Yazoo, from which to act against Haynes’ Bluff. Last night I received a dispatch from Admiral Porter saying that the iron-clads had pushed into Black Bayou, and had reached to within a quarter of a mile of Deer Creek, where they had become entangled in the timber, and could not move until it was cut out, and asking me for a force of 3,000 men to act with him. Fortunately I had already sent all that the boats at hand suitable for that navigation and immediately available could carry. I am now sending the remainder of Sherman’s old DIVISION, and will push troops through, if Sherman reports favorably, as fast as our means will admit. These troops go up the Mississippi River in large transport about 30 miles, and to where Steele’s Bayou comes within 1 mile of the Mississippi. The small-class boats can ferry them from that point, and thus save the distance from the mouth of the Yazoo to, and also the most difficult part of the navigation in, Steele’s Bayou. There is evident indication of considerable excitement in Vicksburg. I think they are removing many of their troops, but cannot satisfy myself to what point. Some we know have gone up the Yazoo, and it may be that others are going to Port Hudson. I have no means of learning anything from below, except what is occasionally learned through Southern papers. I wrote to Gen. Sherman, asking him to detail troops to support Adm. Porter’s move up Steele’s Bayou. You will proceed as early as practicable up Steele’s Bayou and through Black Bayou to Deer Creek, and thence with the gunboats now there, by any route they may take to get into the Yazoo River, for the purpose of determining the feasibility of getting an army through that route to the east bank of that river, and at a point from which they can act advantageously against Vicksburg. Make such details from your army corps as may be required to clear out the channels of the various bayous through which transports would have to run, and to hold such points as, in your judgment, should be occupied. I place at your disposal to-day the steamers Silver Wave and Diligent, the only two suitable for the present navigation of this route. Others will be supplied you as fast as required and they can be got. I have given directions, and you may repeat them, that the party going on board the steamer Diligent push on until they reach Black Bayou, only stopping sufficiently long at any point before reaching there to remove such obstructions as prevent their own progress. Captain Kossak will go with this party. The other boat-load will commence their work in Steele’s Bayou, and make the navigation as free as possible all the way through. There is but little work to be done in Steele’s Bayou, except for about 5 miles midway up the bayou. In this portion many overhanging trees will have to be removed, and should be dragged out of the channel. The boats ahead, got up before me, and improvidently went in before the Bayou was clear. The work has not been very hard, and we are within a quarter of a mile of ‘Deer Creek,’ but it is indispensable that we should have at least three thousand troops at once to hold our present position.If the enemy were to throw in troops, they could stop our work, and put us in a very tight place. I want to see the Soldiers! Please send them at once, if with only one day’s rations. The work is quite practicable, tho’ it looks bad before the boats go through. Yours in haste. At present the head boats are stuck between the trees. The Champion got up here without the Mortars. The Benten cannot come through unless the place is cleared more than it is at present. I sent to day one boat with soldiers and send to-morrow two more, all I have suited to that navigation. I will send in the morning troops to the Bayou where it approaches the Mississippi the nearest which will have to be ferried up with the boats there. This will give you seven or eight hundred troops on arrivals of the boats, and all you ask as fast as they can be taken up from the point designated. All the cooking utensils and rations for the command will be taken on the boat that goes directly through so that there will be nothing but men to embark at the midway point. Mar 15 1863. The expedition by Gen. Quimby through the Yazoo Pass has run into Rebel fortifications near Greenwood. I am examining an alternate route to the Yazoo River through Steele’s Bayou. Steel’s Bayou empties into the Yazoo River between Haines’ Bluff and its mouth. It is narrow, very tortuous, and fringed with a very heavy growth of timber, but it is deep. It approaches to within one mile of the Mississippi at Eagle Bend, thirty miles above Young’s Point. Steel’s Bayou connects with Black Bayou, Black Bayou with Deer Creek, Deer Creek with Rolling Fork, Rolling Fork with the Big Sunflower River, and the Big Sunflower with the Yazoo River about ten miles above Haines’ Bluff in a right line but probably twenty or twenty-five miles by the winding of the river. All these waterways are of about the same nature so far as navigation is concerned, until the Sunflower is reached; this affords free navigation. Admiral Porter explored this waterway as far as Deer Creek on the 14th of March, and reported it navigable. On the next day he started with five gunboats and four mortar-boats. I went with him for some distance. The heavy overhanging timber retarded progress very much, as did also the short turns in so narrow a stream. The gunboats, however, ploughed their way through without other damage than to their appearance. The transports did not fare so well although they followed behind. The road was somewhat cleared for them by the gunboats. In the evening I returned to headquarters to hurry up reinforcements. Map by Hal Jespersen, www.cwmaps.com. I received the following letter from Gen. McPherson. Gens. Quimby and Ross are having difficulties in navigating the backwaters near the Yazoo River. GENERAL: Inclosed please find copies of dispatches just received from Generals Quinby* and Ross, which will give you an idea of the difficulties they have to contend with. 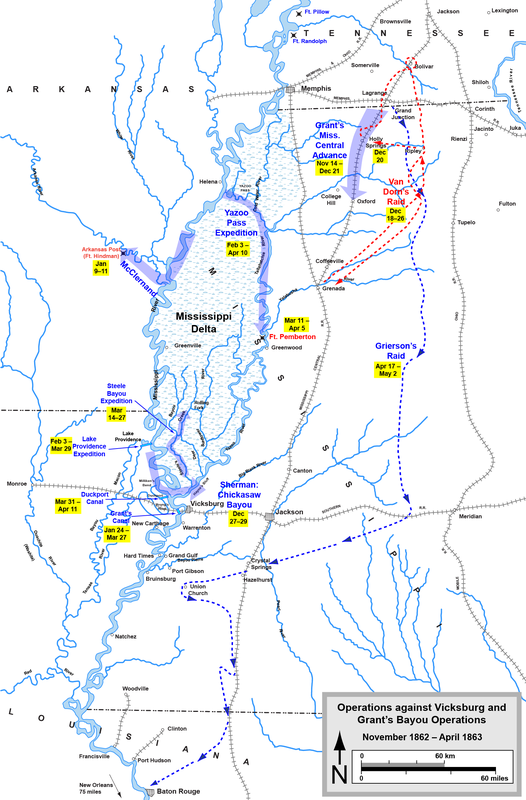 The whole country on the east side of Mississippi in the vicinity of Yazoo Pass and in Moon Lake is overflowed, and General Quinby was obliged to disembark his troops on the western bank of the Mississippi, not far from the Pass, on the only dry ground he could find. As General Quinby was obliged to discharge some boats for repairs, only six have returned, and I cannot learn that any more are coming down. These will carry about two THIRDS of Logan’s DIVISION. Unless I can obtain more boats, it will take over two weeks to get the command here to the entrance to Moon Lake. I am extremely anxious to get into the Yazoo as soon as possible with re-enforcements, for I am apprehensive that Quinby will meet with a stronger force than he can attend to. General Logan’s DIVISION will commence embarking tomorrow, and will probably be off the day after, or at least as much of it as the boats can carry. Colonel Lagow has, I presume, given you all the points in relation to cotton, contrabands, cutting the levee, &c.
BEFORE Vicksburg, March 13, 1863. Lagow has just returned, and called my attention to several points that you want instructions on. As regards Quinby going into the Pass with his present transports, he is the best judge of the practicability. Let him use a proper discretion. I have sent north for small class steamers, which should be expected to commence arriving soon. In regard to the contrabands, the question is a troublesome one. I am not permitted to send them out of the department, and such numbers as we have it is hard to keep them in. You have received my order with regard to the pioneer corps. This will enable you to use 300 men to each DIVISION. The balance will be left at Lake Providence as long as it is a military post. When it is broken up they will have to be sent to Memphis, or some other prominent post. Memphis will be the place, in the absence of other instructions. Exercise your own judgment about when the levees should be cut at Lake Providence. The object of having cotton brought in is to make some of our transports into rams. I will send up for what you have collected, which, with what we have, I think will be sufficient for the purpose. The Yazoo expedition seems to move slowly. Wilson thinks the ranking naval officer is somewhat to blame. I am anxious to see Quinby in with his force. I have a great deal of confidence in his judgment, and still more in the increased there will be in the Yazoo when he gets there. My instructions may not have been plain in one point, but I want Quinby to move as rapidly as possible until he joins Ross, and not wait for transports to take his whole DIVISION. Have him go in just as rapidly as the transports can taken him. Mar. 11 1863. I have received two letters from Gen. McPherson reporting several rumors and informing me that he thinks it possible to move boats through Bayou Macon. Lake Providence, La., March 9, 1863. GENERAL: A couple of my scouts have just returned from the WEST side of Bayou Macon, having crossed the swamps and bayou in a canoe. The report a force of 300 or 400 rebel cavalry on the Macon Hills, nearly WEST from Bunch’s Bend, and a force of 3,000 infantry, mostly conscripts, near Floyd. I would send out an expedition after the, but it is impossible to get across the country on account of the high water. They also report, as current among the secessionists, who are in weekly communication with Vicksburg by a route which strikes the Mississippi River nearly opposite Warrenton, that the Indianola was not sunk, and, in fact, very little injured; that she was captured by boarding, and nearly all the officers and crew taken prisoners; that she immediately started, with the ram Queen of the West, for Port Hudson, and arrived in time to participate in the attack against General Banks has met with a serious repulse; that the rebels have four steamboats up the Red River converted into gunboats, ready to come down as soon as our transports make their appearance. I give you these reports for what they are worth, simply stating that the rebels on the WEST side of Bayou Macon believe them to be true. General Quinby’s DIVISION left Grand Lake day before yesterday (the 7th), at 12 m.
We have here now about 2,000 negroes-men, women, and children. What is to be done with them when the command leaves? I shall go up to Moon Lake, with General Logan’s DIVISION, probably the last of this week. In consequence of the water incommoding you so much opposite Vicksburg, do you want any of the boats sent by General Quinby from Moon Lake, and ordered to stop here to take up General Logan’s DIVISION, sent down to you? None of them have arrived yet, though I shall expect some by day after to-morrow. Order Mr Hood’s cotton restored to him, and also give him authority to ship it to Memphis, and sell, there on his own account. He cannot be authorized to sell this side of Memphis. I think it highly probable a force has been sent up the Yazoo to meet our coming down, but do not think it can amount to anything like the number indicated in your letter. I am anxious, however, to see you in the Yazoo in person, and with all the force you can take in I have sent North for boats, of a class to navigate there and they ought to be in Moon Lake as soon as you are ready to use them. I do not much think of using by Bayou Macon even if it can be used at this time. It would too much seperate my forces. I told you when your forces were in the Yazoo river to send for Gen Washburne and the Cavalry I have given the order for them to be ready, and to obey your summons without further notice from here. They will probably be on the Coldwater, or at least in Moon Lake when you call for them. There is no doubt of her destruction. Hon. E. B. Washburne, M. C.
Now that Congress has adjourned I have thought possible you might want to make a visit to this part of the country. I need not assure you that I would be most glad to see you here and have you stay during the contest which will take place in the next thirty days from this writing. You will have time to join me if Mails are prompt. The canal through would have been a success by to-day but for the great rise of water. The river is now several feet above the whole country hereabouts and our canal was dependent for its success upon keeping the water out of it. The upper dam has broken and submerged things generally. To stop this off’ will take a number of days, but we will do it. In the mean time, so far as I now know, and have official reports, the Yazoo Pass expedition is going to prove a perfect success. This is highly important if for no other purpose than to destroy the transportation, and embryo Gunboats, the enemy had there. They have been working for one year on one boat, of gigantic proportions, up that stream. Lieut. Col. Wilson, a young man of great merit, who has been put on Gen. Hunter’s staff, but who was on mine as a Lieutenant and I objected to relieving until the present campaign is over, writes to Rawlins in a private letter that our success in getting into Yazoo Pass is due to the energy of C. C. Washburn. He felt an interest in the enterprise and took hold with a will, and with men, worthy of the object to be accomplished. I have ordered the Army Corps of McPherson through that way with additional forces making him effective men to the number of about 28,000. McPherson is one of my best men and is fully to be trusted. Sherman stands in the same category. In these two men I have a host. They are worth more than a full Brigade each. McPherson will effect a lodgement on the high lands on the Yazoo river. East bank, and will co-operate with the troops from here. The class of transports adapted to the Pass being so limited some delay will necessary take place in getting them to their destination. I have sent up the river for all the small class of boats that can be got. We are going through a campaign here such as has not been heard of on this continent before. The soldiers see the position of the enemy in front of them but I presume do not see how they are to attack. Their camp ground is several feet below water held in its place by the levees, Constant rains falling keep the roads almost impassable.—With all this the men are in good spirits and feel confidant of ultimate success. The health of this command is a subject that has been very much exaggerated by the press. I will venture the assertion that there is no Army now in the field showing so large a proportion of those present with their commands being for duty. Really our troops are more healthy than could possibly have been expected with all their trials. Although I have told you but little of plans here it is more than I am in the habit of writing on this subject. You will excuse me therefore from saying how I expect to co-operate with McPherson, at least until you should come down. Gen. Washburn will have command of a very important Cavalry expedition from the Yazoo river if all other plans succeed.